Saavik was given an excellent upbringing on Vulcan and soon embraced the Vulcan way of life, but decided that she wanted to follow Spock into Starfleet and entered Starfleet Academy in 2281, assigned to live in Residence Complex Three. 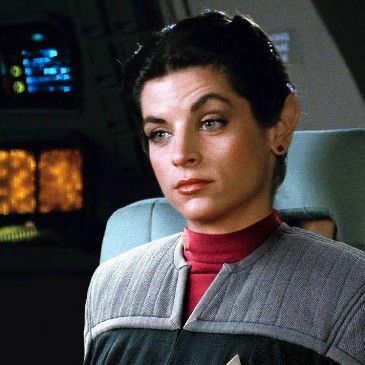 Her time at the Academy was not the easiest, and many of her classmates viewed her as an enemy, but she became a valuable resource for Starfleet in interpreting intelligence data and putting many myths to rest about Romulan psychology. She also forged a friendship with Cadet Peter Preston, whom she tutored in Advanced Theoretical Mathematics. In March of 2285, Saavik was a Starfleet cadet and, while mentored by Spock at Starfleet Academy, she underwent the Kobayashi Maru scenario. Despite an in-depth awareness of Starfleet regulations, she chose – during the test – to violate the Neutral Zone Treaty by venturing across the Klingon Neutral Zone in an attempt to rescue the freighter Kobayashi Maru, an action that resulted in the simulated deaths of all other officers in the bridge simulator. Afterwards, Saavik related to Admiral Kirk that she doubted the non-winnable simulation had been a fair test of her command abilities, though Saavik also conceded that she had not considered how possible such a situation was in reality. Saavik was thereafter assigned aboard the Enterprise as navigator under Admiral Kirk, firstly in a training cruise that was then prematurely terminated so that the ship and crew could respond to the Genesis crisis. During these missions, Saavik was the highest-ranking cadet from a training crew on board the vessel. As such, she occasionally occupied the ship's command chair and was even permitted to supervise the vessel's departure from spacedock, which she had never done before. Saavik struggled to become acquainted with Human personality traits and was inquisitive as to how Kirk had handled the Kobayashi Maru scenario. At this stage in her career, she often quoted Starfleet regulations and was surprised by the way Kirk occasionally bent those rules, questioning several of the commands he gave her. Saavik's mettle – as a prospective officer-of-the-line – was actually tested when the Enterprise was unexpectedly engaged in a drawn-out battle with the commandeered USS Reliant. Though she acquitted herself well under the stress of battle, she was admonished by Admiral Kirk that knowing regulations by heart was not enough and that she still needed to learn "why things work on a starship." As an away team member on one particular away mission amid the battle, Saavik visited both the Regula I space station and the Genesis cave, the latter of which was beneath the surface of Regula. She concluded that – as Kirk's method of beating the Kobayashi Maru test had been to cheat the system – he had never faced death. Saavik's mentor, Spock, was killed during the closing stages of the battle. Despite her Vulcan stoicism, Saavik wept at Spock's funeral. Later that year, Saavik was transferred to the Grissom, where she further studied the Genesis planet along with Kirk's son, David Marcus. There, they found the body of Captain Spock, who was believed lost. When Saavik and David found him, Spock's regenerated body was physiologically that of a child, but he aged rapidly. Saavik helped Spock through the agonies of pon farr by mating with him. Afterwards, she and her companions were captured by Klingons. Though a d'k tahg-wielding Klingon officer attempted to murder Saavik, her life was saved by David, whose intervention in these circumstances resulted in him being violently killed by the Klingon. Saavik returned to Vulcan with the Enterprise crew, to reintegrate Spock's katra into his body, in 2285. In 2286, Saavik explained to Kirk how his son had died bravely saving her as well as Spock from the Klingons. She remained on Vulcan with Spock's mother, Amanda Grayson, when the Enterprise crew – together with Captain Spock – returned home for Earth. Saavik remained on Vulcan for an undisclosed amount of time due to being pregnant with a daughter she & Spock named T'Val. Saavik was an eye witness to the events of the Tomed Incident in 2311. During that time, a child ran from her in terror at the sight of her "Romulan" features. Saavik made her way up through the ranks, and by the year 2329, Saavik had become the first officer of the USS Armstrong. She held that post until at least 2344. She and Spock had remained close over the years, and their relationship eventually grew beyond camaraderie into something more. In 2329, the couple became betrothed in a formal ceremony on planet Vulcan that was attended by Admiral Leonard McCoy and Lieutenant Jean-Luc Picard. In 2344, she was sent to the Romulan Star Empire on an unofficial assignment by Captain Uhura of Starfleet Intelligence to retrieve Spock, who had answered a mysterious summons from the Romulan commander Charvanek. When Saavik arrived on Romulus, she found the Romulan capital in a state of turmoil. The mad Praetor Draleth was planning on launching an unprovoked attack on the Klingon colony at Narendra III in order to start a quadrant-wide war. Spock instructed Saavik to leave Romulus and raise the alarm for Narendra while Spock (who was suffering from the beginning stages of Pon-Farr) and his ally Ruanek took care of Draleth. Saavik managed to reach the USS Enterprise-C, who went on to defend Narendra, while sending Saavik back to Vulcan, where she was soon reunited with Spock. Soon after, the couple were officially married in another ceremony, this one attended by both McCoy and Uhura. Saavik eventually rose to the rank of Captain, and was content for a time to command science vessels while the Federation was at peace. When the war with the Dominion broke out in 2373, she requested command of a combat-worthy vessel, and was given command of the USS Alliance. At some point during the war in 2374 she was injured in ship-to-ship combat and transferred to home duty on Vulcan. Her former first officer, Captain Howe, sent her a "get well cactus" that she described to Spock as "a superfluous xerophyte." While on Vulcan, Saavik accepted command of the planet's defenses. In early 2377, she led a diverse convoy of vessels into the space of the mysterious Watraii, who had announced plans for a genocidal war against the Romulan Star Empire. In this first encounter, Admiral Pavel Chekov was believed to have been killed in a transporter accident. After it was discovered by Uhura that Chekov had not been killed, but was instead languishing in a Watraii prison cell, Saavik took the Alliance back into Watraii space for a rescue operation. The effort was successful, but Saavik had to deal with the immediate consequences of the rescue operation.